a minima is a wine born for enjoying, the fruit of the union of that robust Gamay and that subtle, racy fine Pinot Noir. At the estate, both these stocks put down their roots in the Grands Champs plot. Located on the Gevrey lands, this terroir, which was replanted by Louis and Jean Trapet in 1965, is right next to the Gevrey-Chambertin AOC. “a minima” means, literally, “to appeal against a very light sentence”. The idea for this wine came from a simple observation, freely inspired by Mr. Jules Chauvet* 1960: “Adding sulphites to the harvest is not advisable, knowing that both the yeast and intracellular fermentations give the best yield when there is no SO2″. a minima is the reflection of its birthplace: the wine-maker helps its birth and supports it. The notion of respecting the grape reaches its paroxysm here. Intensive work is carried out before the harvest (biodynamics, etc.) and during the harvest (harvesting by hand, sorting, using gravity, etc.) 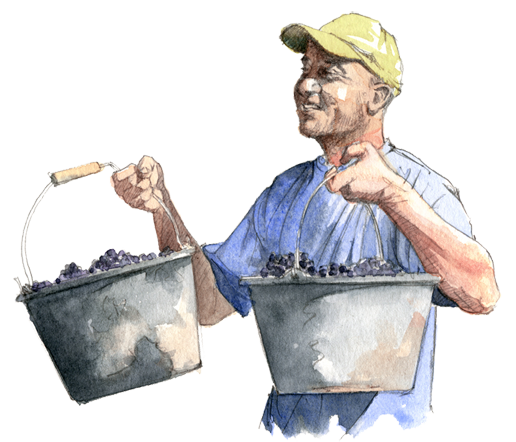 Once the grapes are in the vat, we use no sulphur and the fermentations start naturally. A wine from winemakers, a minima intrinsically reflects the skills of each one, the pride in an achievement and the most beautiful expression of a terroir possible. * for more information about Monsieur Chauvet (Beaujolais winemaker-scientist and father of analytical tasting): Jacques Néauport’s superb book: Jules Chauvet ou le talent du vin (Jules Chauvet or a talent for wine). Communications scientifiques, JP Rochet publications.